I feel the coming and going of my capacities and resources. I am intermittence. I would like to be more at ease with this and trust to the natural process and rhythm of the tidal bits of me. I want to trust to my self-understanding and attunement. I want to – but there is this voice that comes with/to me at these times, and though I try to set my sail to not be caught up in that wind, I am drawn in by its siren song. The well-worn tune plays and re-plays singing me to the rocky shore to crash upon the rocks of that which I fear I cannot do: I am clearly not enough. Image: Photo of sky and mountans and rising moon in tones of blue with a sillouette of overhanging branches in the right foreground. A pencil sketched boat (based on a drawing by Maurice Sendak’s “Where the Wild Things Are”) is sailing across the mountans. A frizzy-headed person wearing a wolf suit is in the boat. Text on the boat reads “Whose story is this anyway…” and “LEAH”. Text of the poem “I am Intermittence” (above) is overlaid in white font. Activism is gruelling, slogging, hard work… and it is seemingly unending. It can be hard to step back and take a break and find space to be renewed (even a little) when you are committed to making change and there is so far to go… so much work to be done. I get that it is hard to not be busy, because, I know for me at least, it feels like taking action is empowering. And, collectively, I believe we are going to make things better for people. Things will change. I think too, it can be difficult to take a break or step back because that can feel like a lack of committment – and the dedicated activists I know are unendingly generous with what they offer of themselves. But this is a long haul thing… and I noticing that I am not taking care of myself. And I think this is in part because when things are tough my tendency is to respond with “that means there is work to be done’ and then work alongside others to try to make a difference. However, lately, it feels like everything has intensified, because I seems cannot look away from the things I find horrific, and I absolutely do not want to be quiet or complicit, or to respond (or not respond) in ways that normalize the denial of human rights for other people. I am struggling with this… and working to understand how to find a balance so that I am not neglecting myself and so I can sustain pushing back against injustice over time. I am not quite there – but I think I might be moving in a good direction in reminding myself that self-care, too, is resistance! Okay… I gotta go write a poem and do some art and daydream about unicorns now!!! This “Self-care is Resistance!” Neurodivergent Narwhal image was created for this post by Lei Wiley-Mydske. You are welcome to print this spectacular colouring page (with attribution). How perfect is that!?! Please note: The wonderful Neurodivergent Narwhal art and images in this post were provided by the ever-talented and creative Lei Wiley-Mydske and have been used with permission. 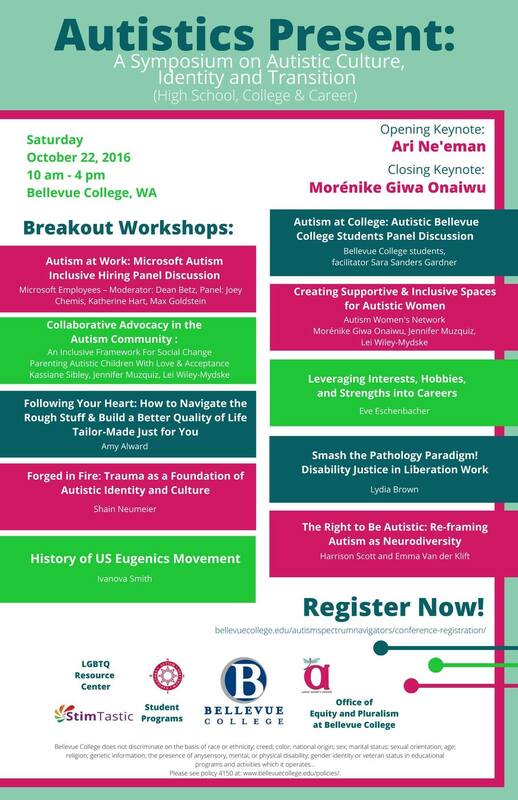 I appreciate Lei and the amazing work she does with the Ed Wiley Autism Acceptance Library, and with AWN (Autism Women’s Network), Parenting Autistic Children with Love and Acceptance, and her blog, Autistic Times Two. Lei also has a wonderful Red Bubble Store where you can get t-shirts and mugs and stickers and tonnes of other good things with narwhals and other cool art on them!! Eeeeeee! In this house we do acceptance. I promise to never use my child’s most vulnerable moments for sympathy or to “raise awareness”. I recognize that I am my child’s safety net against an often hostile world. When I feel like sharing, I will ask myself if this is something that I would want others to share about me. I will never blame autism when I have a hard time parenting my child. Parenting is stressful at times, but rewarding as well. This is true for ANY child and I will recognize this. I will prioritize the voices of Autistic people over the “experts” as I recognize that Autistic people are the ultimate experts on their own lives. I will throw out the myth of a “developmental window” and acknowledge that my child will grow and learn in their own time, in their own way with my love, guidance and nurturing. I will never apologize for my child being openly Autistic. I will look at every therapy offered to my child with a critical eye. I will ask myself what is the desired outcome? Is it supportive or is it attempting to change my child’s neurology? I will never force my child into therapies that vow indistinguishability or that seek to “fix” or promise a non-Autistic version of my child. I will embrace the neurodiversity paradigm and celebrate my child as a beautiful part of the wide and diverse spectrum of humanity. I will learn about the social model of disability and confront ableism when I see it. I will learn about the disability and autistic rights movements and use my privilege to further the cause. 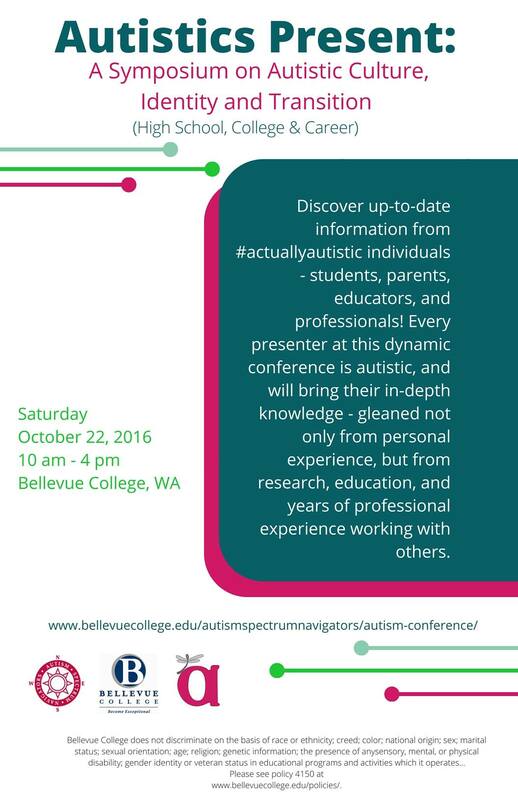 I will learn about Autistic culture and find Autistic friends, not just for my child but for me as well. I will promote acceptance and lead by my example. I will learn about identity first language and show my child that I am proud of their Autistic identity. I will NEVER say that I love my child but not their autism. 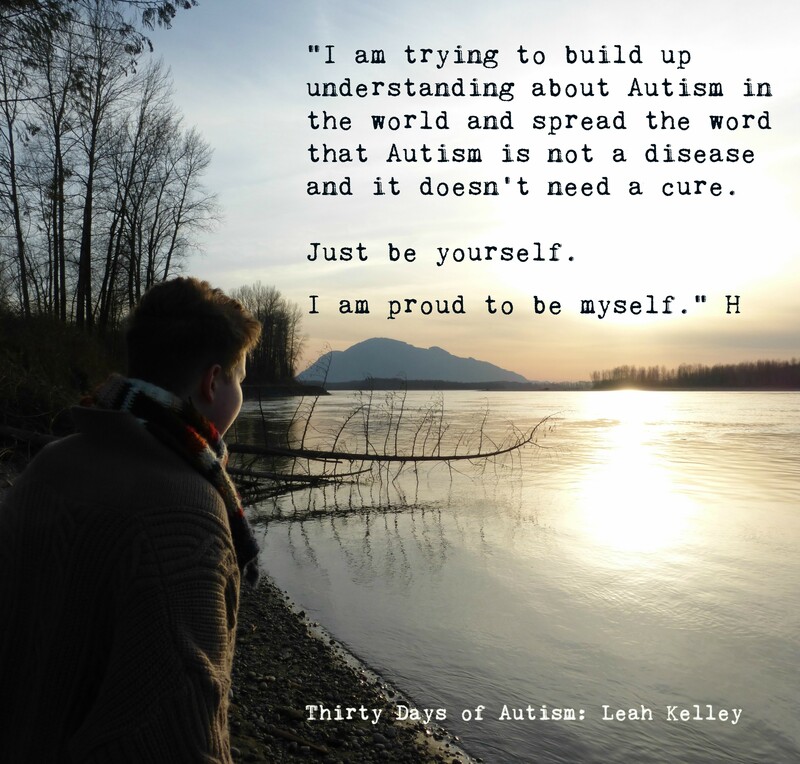 I will recognize that autism is an integral part of who they are and shapes how they view, process and experience this world. I will love every part of my child. I will never teach them shame or internalized ableism. I will never fight autism, but I sure as hell will fight for my child’s right to be exactly who they are in this world. I will recognize that I am only human and I will make mistakes along the way. I will forgive myself and do better. For a printable version of this Behavior Plan, click here. This article is shared here with the permission of the author, Lei Wiley-Mydske, and was originally published at We Always Liked Picasso Anyway. 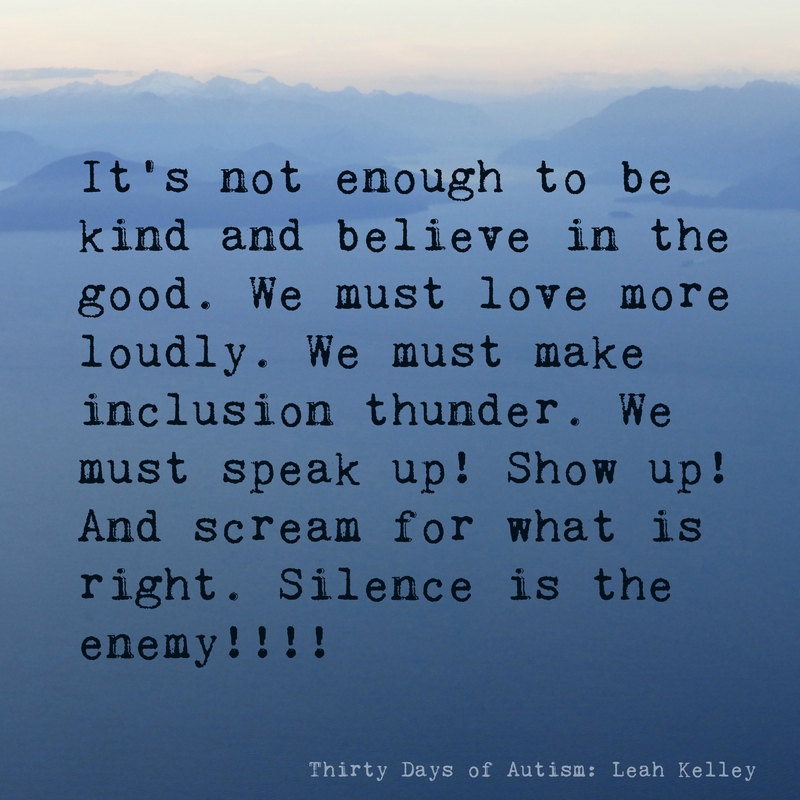 Please check out the other amazing posts there, and if you are in a position to do so, please consider contributing to support Lei’s amazing work at the Ed Wiley Autism Acceptance Lending Library (which you can read about here). Last night, on the night before Thanksgiving, we carved pumpkins. Yes, you heard that right! 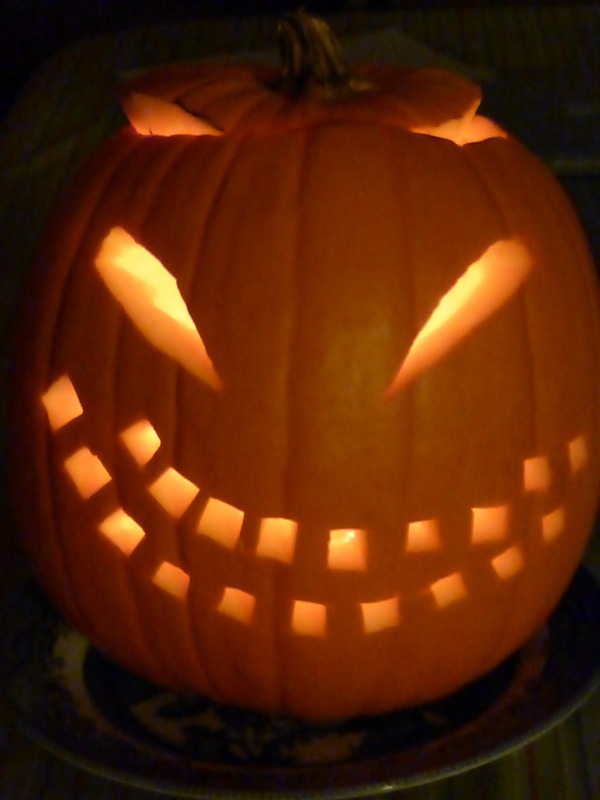 Image: A jack o’lantern carved by H.
And today we travelled up the Fraser Canyon with our good friends – five of us in all. 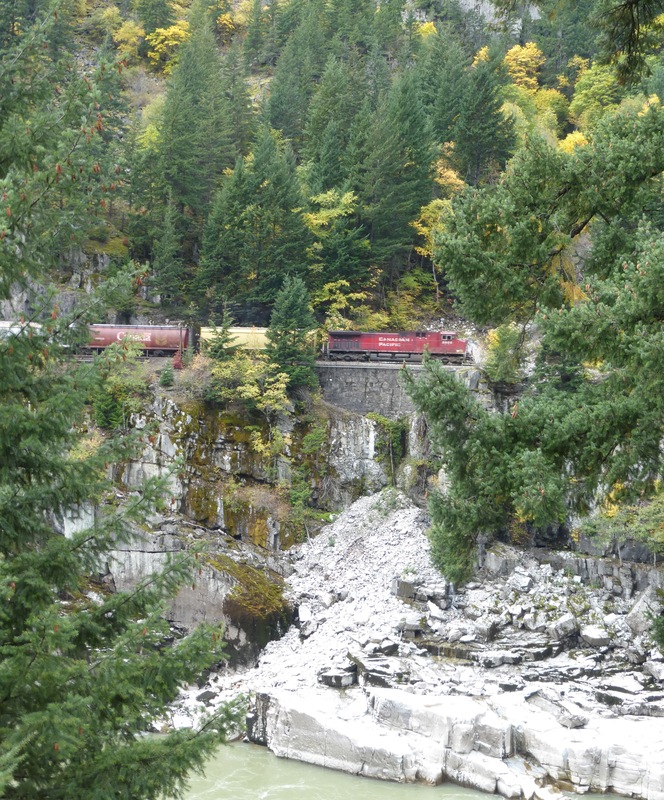 We each had a pumpkin, that would serve as our ticket for the Hell’s Gate Airtram that stretches across the narrowest most treacherous part of the rocky canyon, through which the Fraser River has carved its path. It is ridiculous… and spectacular… and amazing! 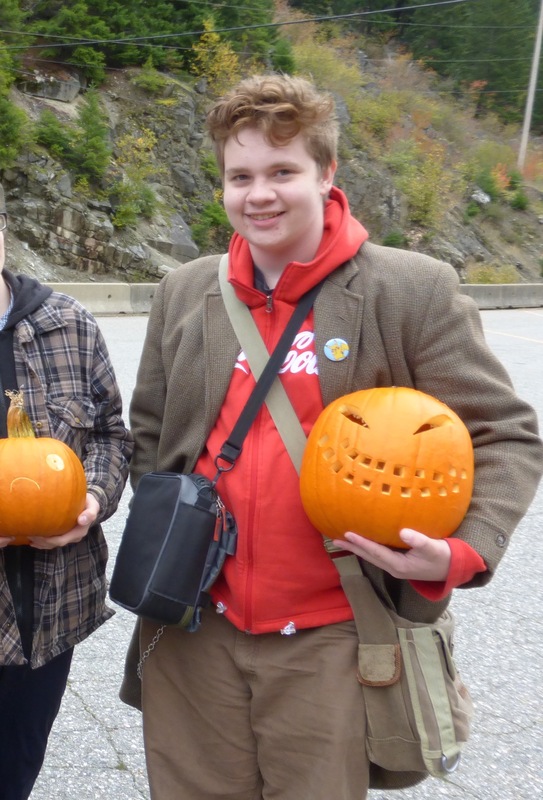 Image: The arms and bodies of four warmly clothed people holding carved pumpkins. Image: H holding his pumpkin. 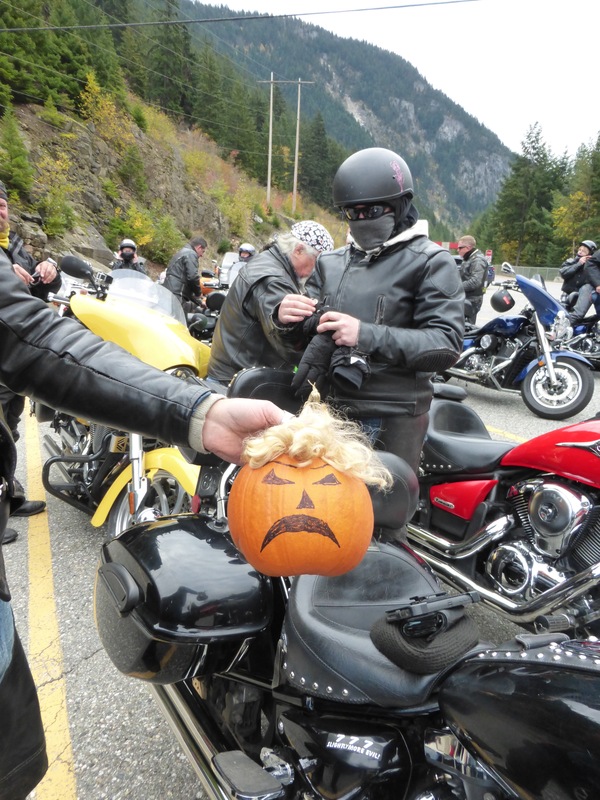 We weren’t the only ones travelling with pumpkins, though we agreed that this biker’s pumpkin was definitely the most terrifying of the lot. And I took about a billion photos… and a rather shaky video. 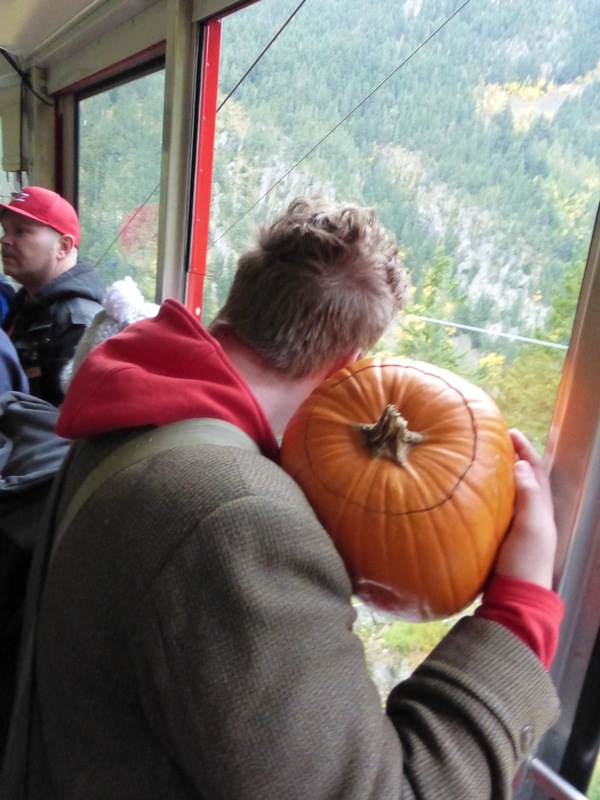 Image: H in the airtram – preparing to toss his pumpkin. 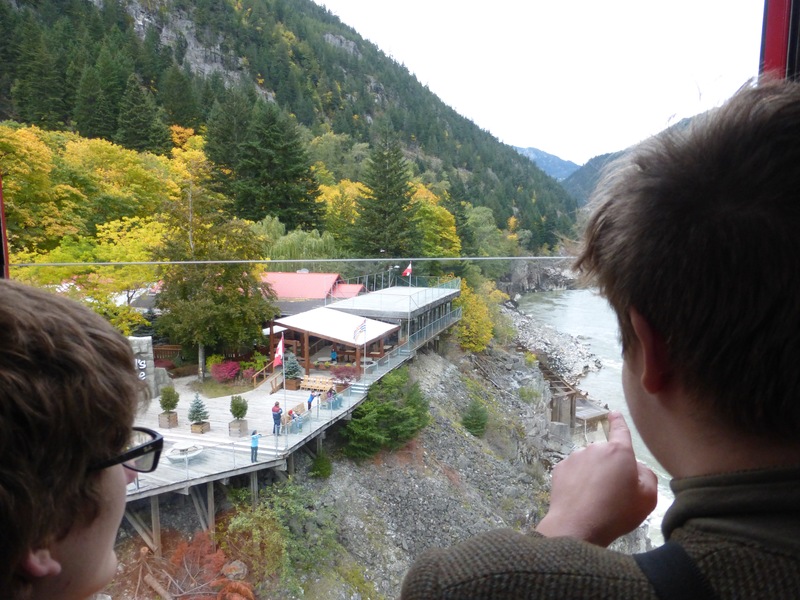 Image: H and K looking out at the view from the airtram. 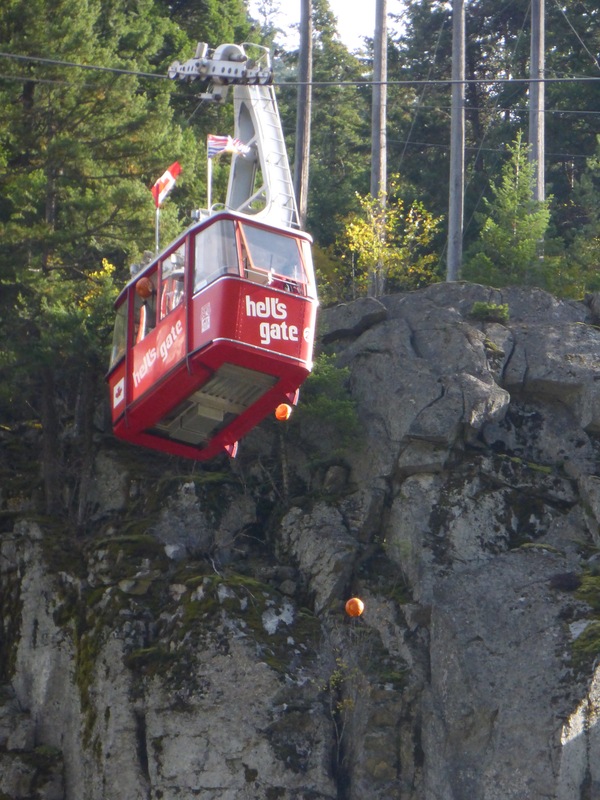 Image: The Hell’s Gate Airtram with pumpkins being tossed out. 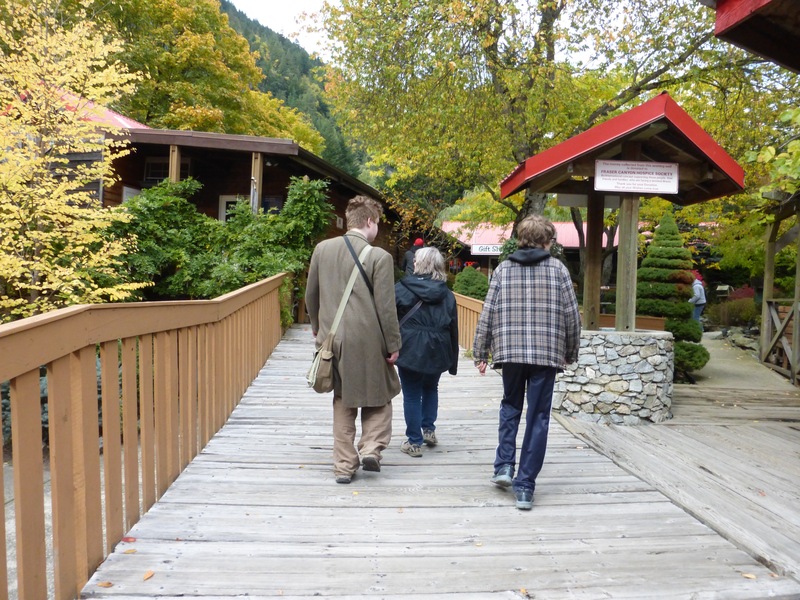 Image: H and friends walking toward the interpretation area on a wooden deck surrounded by trees. Image: H and K in front of the Hell’s Gate sign. 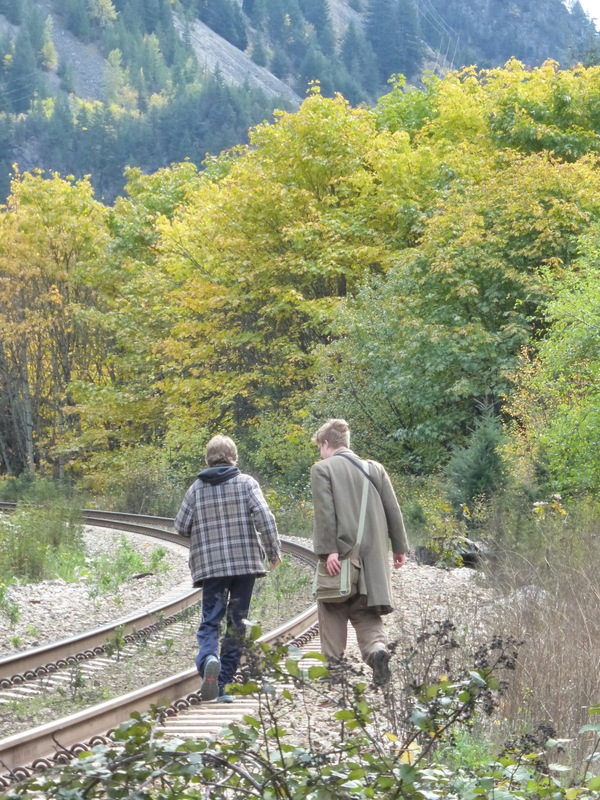 Image: H and K walking along railway tracks lined by forest and mountains. The are exploring and H is foraging/hoping to find some bits of metal for blacksmithing. 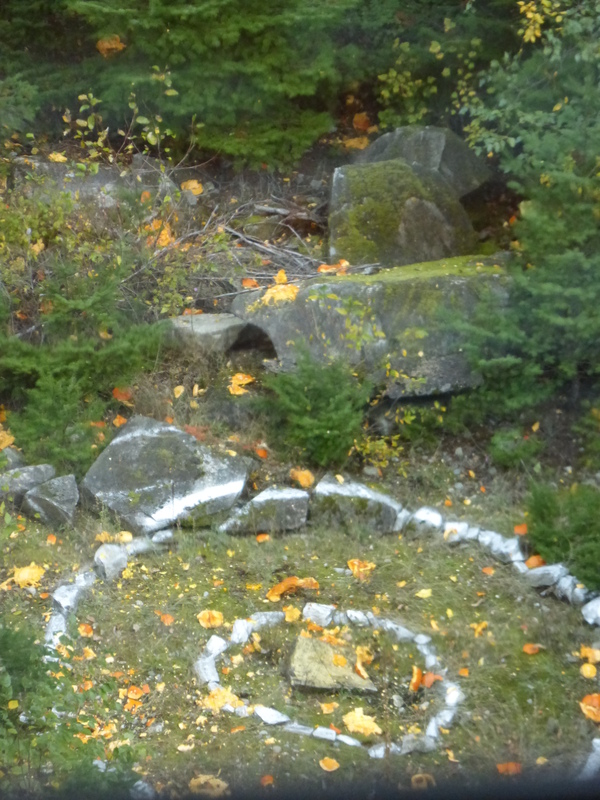 Image: The target on the ground below the airtram covered in smashed pumpkins. And finally, here is a rather poor quality video of the pumpkin toss. I must warn that it is jarring and possibly seizure inducing in the random movements of my camera. Yikes! I will try to get better at this in the future. ❤️ I am so grateful for these people and their friendship! It was a ridiculously fun and spectacular day! So your child was just diagnosed with autism. Breathe. Breathe deeper. Relax. It’ll all be ok. But you have some work to do. The first thing you need to do isn’t find therapists. It isn’t commiserate with other parents. It isn’t become an AAC expert (though all of these things have their place!). It’s something not in the autism introduction packet: you need to connect on a human level with adults like your child. You need to go make some Autistic friends. I don’t mean a mentoring relationship, though those are extremely important and I am a big fan of mentoring (and mentoring your child & being friends with you are not mutually exclusive). I definitely don’t mean “translate my child to me” (which is not a friend thing particularly). I mean find local Autistic adults with whom you have common interests and connect as equal human adult people. First, and possibly most importantly but mileage varies: your child is noticing things. If you go through a mourning phase, or a difficult adjustment phase, your child will notice and possibly blame himself. Your child may not have the vocabulary for it, but at some point he will figure out that he isn’t the son you planned for and dreamed of, and he might blame himself for that. We figure it out when we’re a disappointment, even if you do your best to hide that you’re having a hard time. Many Autistic children get in our heads, accurately or not, that our parents only tolerate us because they’re stuck with us. Your child needs to see you choosing to be around people whose minds work like his. It’s much harder to think your parents hate you and hate your brain when they seek out the company of people who think like you. Seeing the adults who are dearest to you–and like all children, Autistic youth default to loving their parents–seeing them find someone who reminds you of you? That’s supremely important. Do not underestimate the effect this can have, just knowing that your parents would choose to be around you even if they weren’t “stuck” with you. Another reason: many disabled children never meet an adult with their disability. You might be surprised, and a bit saddened, at the conclusions we come to. Some folks come to the vague idea that we’ll outgrow our disabilities (and when there’s no sign of that, we’re reminded that we’re disappointing, because you can bet we’re getting that message from someone in our lives). Or, I have friends who concluded that their disabilities were fatal. That’s a recipe for severe anxiety, thinking that you’re dying but you feel fine and no one has felt the need to talk to you about your inevitable demise. We need adults like us; this anxiety is completely unnecessary. Your child also needs role models. She may not be able to fill your shoes, or Uncle Bob’s or Auntie Bev’s or her teacher’s or those of any adult in her immediate sphere. But my shoes may fit, or those of another adult Autistic. All children need people in their lives who they can realistically emulate, & Autistic children are no different. I was pretty young when I knew the adult-woman things being modeled for me were just not going to happen ever–and alternatives were never presented. I was surrounded by folks who were similar to each other and not much at all like me. This is stressful. Making your own make is hard, and it’s harder when everything you do is wrong (the premise of somewhere between many and most autism therapies, and a message also sent by peers, random strangers in the store, other adults, etc). Once again, anxiety. It’s easier to believe you aren’t Doing It Wrong when you know happy adults who took similar trails. Knowing options for the future? Seeing unconventional but fulfilling adulthoods? So important. If you have culturally connected Autistic friends, your child also will have a head start on a connection to the community. As he grows older, he will have a life apart from your family. This is a good thing and an essential part of growing up. The Autistic community is his birthright. We as a general rule (can’t speak for everyone) welcome friendly parents, but your child is one of us. It’s wonderful but also overwhelming and scary to discover a place where you’re “normal” when you’ve never been, especially all alone. Even good overwhelm is unpleasant when it gets too big. You can make this less of a shock by having Autistic friends. “I’m not alone” doesn’t have to be an adulthood revelation; it can be a given. Your child deserves to grow up knowing that he isn’t alone, that there’s a whole community that will embrace him because he’s one of ours. The gift of growing up with this knowledge? I cannot imagine it having anything but good effects. Also, we’re awesome. Autistic people are loyal and hilarious, among other things. We’re good friends. We might provide insight to things about your kid that you never thought of, completely on accident. Your way of looking at the world may accidentally clarify things for us, too. But in my experience, Autistic people are the funniest people on earth, and the most dedicated to making sense and to fixing things that are not right (admittedly, my sample might be skewed, but I also have a very large sample size). That’s how the people I hang out with roll. Making friends with us isn’t just good for your child. We’re good for you, too, and you can be good for us. A true friendship is a mutually beneficial relationship. We have a lot to offer each other. So breathe, put down the pamphlets about all the different therapies, breathe again, and look in your networks for some Autistic connection. It’ll make your life, your child’s life, and some local Autistic’s life, better. Thank you, K, for your permission to share this important post. 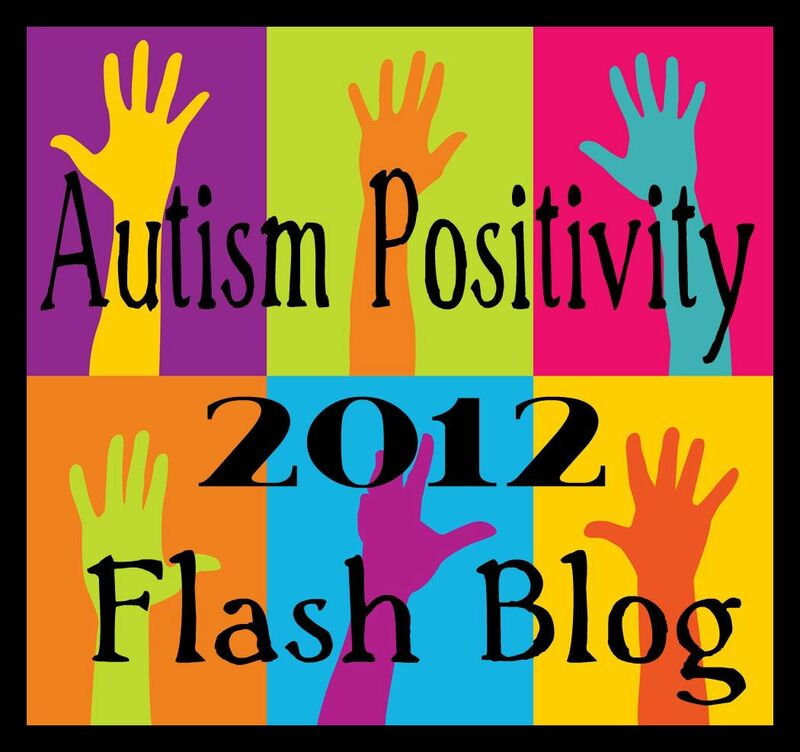 Also – I am pretty sure that my son knows that a good many of the people I love most in this world are Autistic. 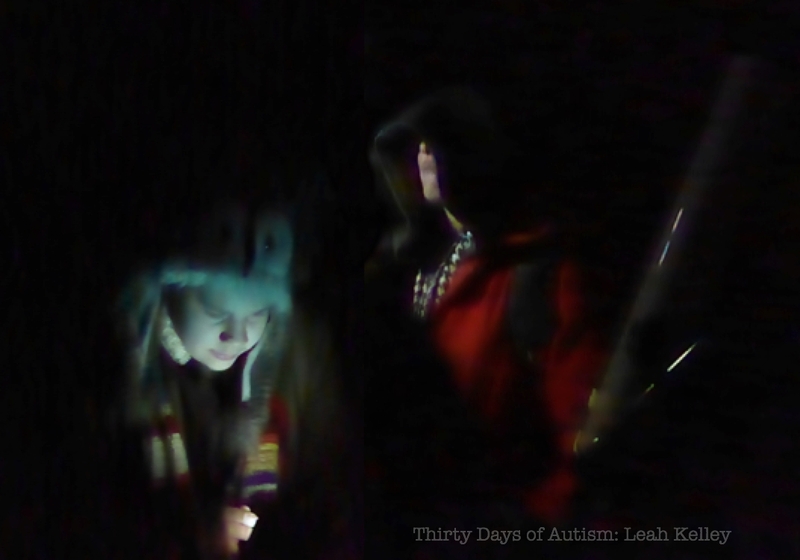 Image: H looking downwards, dressed in vintage wool trench coat, Dr Who scarf, and owl hat. K is standing slightly behind, mostly hidden by darkness and a hooded cape over a red/orange jacket. K is holding what appears to be a wooden staff, but is actually a telescope. The background is night black with lighting shining from below. I got home late from work today, lugging my books and bags and laptop and some likely-less-that-healthy Chinese food for H and me to have for an easy dinner, as Craig had a gig. Today I was playing Garry’s Mod and I joined this server and it looked quite promising at first, but when I scrolled through jobs I saw that one of the jobs was ‘Autistic Person’. When I looked at the description I was really offended, because it said “you listen to Drake and cry yourself to sleep and have random autistic outbursts.” I thought it was really ableist, so I then called for an admin. I told the admin that I found that is offensive and that I myself am Autistic, and that I am an advocate for Autistic people. I was asking them if they could remove that from the server. And then two other admins got involved. We had a small meeting. I told them being Autistic is something you are born with, like your sexuality… like if you are straight or gay. And I told them about ASAN and that I present at conferences and they listened to me. I feel really good about myself. They said they will try to get it off the server, and I will be checking in a few days to see if they did anything about it. Apparently some of the admins are Autistic, and they didn’t really find it offensive the way I did, because I guess they’ve grown used to it. I am trying to build up understanding about Autism in the world and spread the word that Autism is not a disease and it doesn’t need a cure. I am proud to be myself. And a final note of gratitude from Craig and me: We are thankful to have amazing Autistic, Neurodivergent, and otherwise disabled friends in our lives. If it takes a community to raise a child – this one is raising up a fine young man! This weekend I began the third term of my EdD Program at Simon Fraser University, and I have been quiet about that here, but I am thinking now it may be relevant to share. The work I am doing is a part of my honouring of my father and holding space for him in a way I have come to understand as a kind of legacy. I am grateful to him for cultivating my belief in lofty goals. I think perhaps for me one of the most profound things has come to me in my efforts to support H. When we knew things weren’t going well for my father, H was in tears and said, “You know I am really going to miss Papa. You know there’s going to be a hole in my life – there’s going to be an empty space…”And it was one of those moments when I paused… thinking please let the words come to me.